The sun streamed through the fog on an early February morning in the oak woodland. California Quail scurried about looking for food. I can still feel and smell the crisp, damp, and earthy woodland air when I look at this. 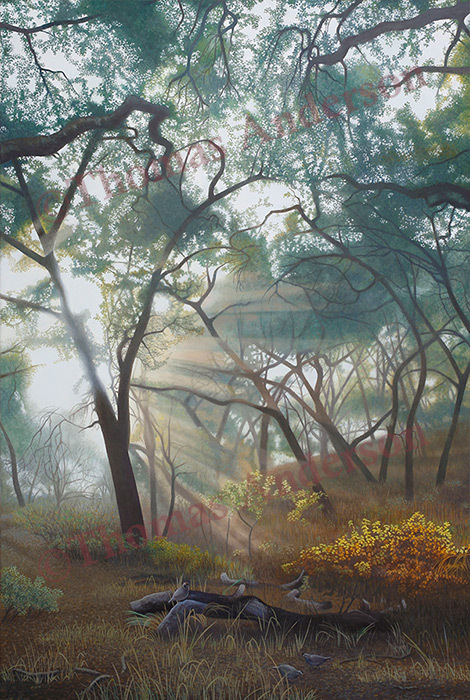 I was captivated by the light made tangible by the fog and how it transformed the forest shapes. The delicate leaves of the trees seemed like lace to me. The sturdy, twisted and intertwined lines of the trunks and branches attest to their constant exposure to the chaos and stress of heat and cold, wet and dry, fire and wind.